1. Peel, core, and slice the apples. 2. Mix the sugar, flour, nutmeg, cinnamon, and salt in a large bowl. Stir in the apples and set aside. 1. In a bowl, stir the flour, sugar, and salt together. 2. Add the chilled butter pieces and shortening to the bowl, cutting them in with a pastry cutter, being mindful not to over mix. 3. Add the ice water and mix until the dough holds together, adding more water if necessary. 4. Place the dough onto a lightly floured surface, knead, and divide it in half. Flatten each half into a disk shape and wrap in plastic. Place it in the refrigerator to chill for at least half an hour. 5. On a lightly floured surface, roll out one of the pastry disks into a circle, approximately 12-in. in diameter. 6. Place the circle into a 9-in. pie plate. With a sharp knife, trim any excess dough from the edges. Return it to the refrigerator until ready to assemble the pie. 7. Pour the filling into the pastry-lined pie plate, and dot with the margarine. 8. Roll out the second disk of dough. Cover the pie, and seal the edges with a fork, or use your fingers to pinch the edges together. Cut a couple of slits in the top, to allow it to breathe while baking. 9. Bake for 40 to 50 minutes, or until crust is golden and the filling begins to bubble through the slits in crust. Tip: Cover crust edge with 3-in. strip of aluminum foil to prevent too much browning and remove foil during the last 15 minutes of baking. 10. Remove from the oven and allow to cool. Dust top with confectioners sugar and serve with vanilla ice cream and whipped cream. Suggested by April Gosling Naude. 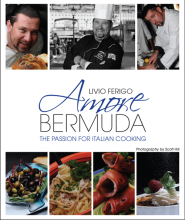 This Month ENTER TO WIN Chef Livio Fergo’s Amore Bermuda cookbook!! Simply try out Livio’s apple pie recipe OR submit your own favorite dessert recipe, and comment/email moc.l1552964927iamg@1552964927adumr1552964927ebnik1552964927eewsi1552964927ht1552964927 to tell us about it. We will choose from the comments who wins!! !